I love some of the new Virtual Reality / Augmented Reality devices coming out (especially CastAR). A couple limitations with the approaches I've seen though is you can't physically touch the environment (video only) and they all require some type of goggles to be worn. I'm sure there are products in development for special haptic gloves you could wear to simulate touch sensations, but can I build something where the real physical touch is built in? 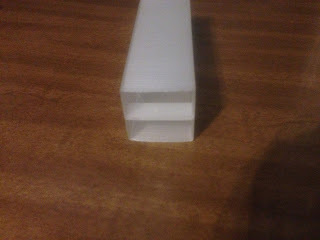 I'd like for the 3-D shape to physically emerge out of the table. In fact there have been a couple movies recently of this in action. If I can find some pictures of those, I'll update this post later with them. To really be useful, I think it needs to have a resolution of 8x8 (Checkers/Chessboard), but I'm starting with a 3x3 prototype - just enough to play Tic Tac Toe. I'm testing out 3 different block shapes: no taper, low taper, and high taper. If I use an overhead projection to put an image onto the blocks, then the taper will allow me to project images on the sides. I like how the "no taper" will sit flush with the table when fully down though. 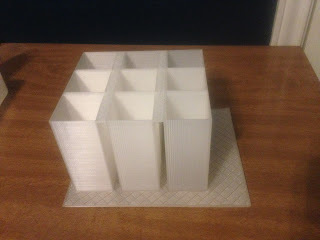 A collapsible block would probably be best, but that complicates things more than I'd like. You can see how the low / no taper blocks became unstable near the end of the print and came out rough. I'm going to clean those up later. Each block has a mount at the bottom that I can tie the servo to. 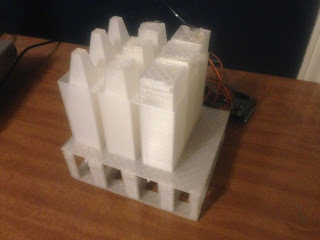 I then printed the block mount that will sit on top of my servos mount. 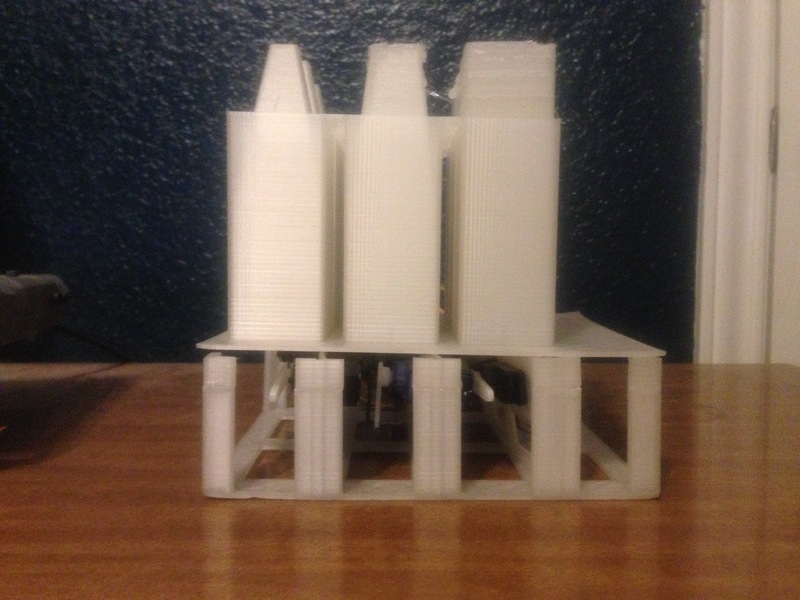 That print alone took 15 hours; I was so glad it came out flawless on the first try! This is just a progress report. I need to actually move the block mount higher so the servos arms can clear the mount and have plenty of throw. When complete, the servos should be able to go from fully extended to fully flush with the table top. Not including failed prints, that was 68 hours of 3-D printing!